There is nothing quite like a homemade cake. Not only do they taste better than a store bought cake, but more importantly there is a great satisfaction in knowing you made it yourself! Baking for me is kind of therapeutic – from mixing the ingredients to watching people enjoy eating it. This particular cake lasted around 24 hours before being devoured. I even impressed a certain someone who claims to not eat cake, unless it’s chocolate! The Peach & Raspberry Tart is definitely one of my favourite and so easy to make. There is no tart crust to prepare and only a small amount of ingredients. The batter is a thick silky consistency, that when topped with the fruit, sets firm and crunchy like a tart on the outside, but moist and delicious in the centre. This recipe comes from Donna Hay’s Off the Shelf, and the only adjustments I would make are the cooking times. I use a slightly smaller baking tin which makes the cake higher, so my cooking time is closer 1 hour, 20 minutes. Follow the recipe, and test with a skewer after 1 hour. This cake will collapse ever so slightly, so try not to open the door while cooking. 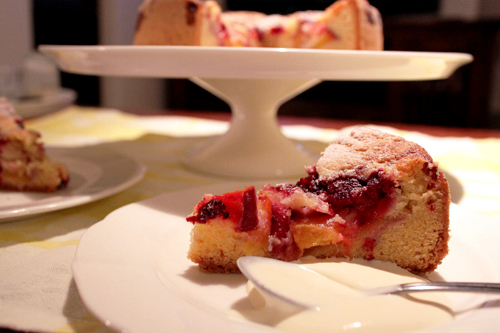 And don't be scared about the lack of milk or liquids - the fruit on top creates the moist centre. Preheat the oven to 160C. Line a 22cm round cake tin with baking paper. 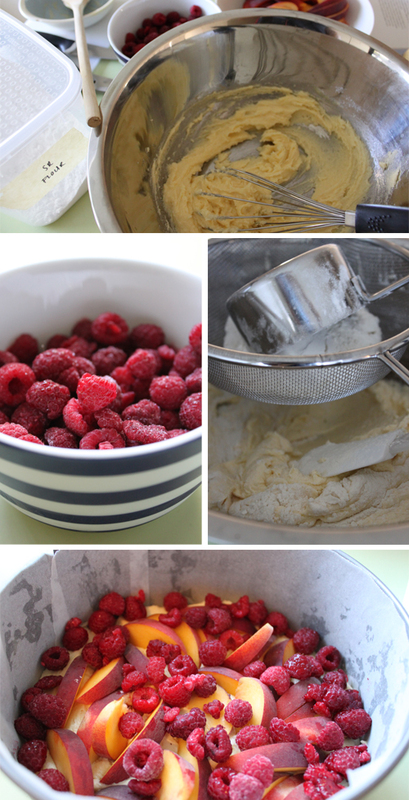 In a bowl, add the butter sugar and vanilla and beat with an electric mixer until light and creamy. Add the eggs one at a time, beating in between. Add the flour and fold in until well combined. Pour the mixture into the tin, and top with the peaches and raspberries. Sprinkle the icing sugar on top. Looks so good Tash!! Glad to see a whole bunch of posts. Already favourited your blog :) Miss you! Your friend Sara got me on this blog, and I have already made this beautiful tart on the weekend.It was a hit, everyone absolutely loved it. We are now thinking of what other fruit we could use. Apple/Fig, Nectarine/blueberry, Mango/Raspberry ooohhh so many!!! Thanks for the comment Susan! I'm glad you enjoyed the tart. Blueberry would actually go perfect with this tart as they are very juicy and release a beautiful colour. Natashia, I have made the tart again and my guests raved about it, but i was wondering do you think that I could substitute the flour for Almond meal. I'm so glad to hear you're enjoying the cake! I guess almond meal could be used instead of the flour, however it would make it even more dense than it already it is. You would also need to add around 2 heaped teaspoons of baking powder as almond meal has no raising agent. If you do try it with almond meal let me know how it goes! Love this recipe, made it many years ago but found it again and the family love it.